Easy Kettle Corn – our all-time favorite homemade kettle corn! Learn how to make kettle corn that is great for movie night, game day, or snack time! I love watching movies, but I don’t like going to the theater. It’s always cold, the chairs are uncomfortable, and it’s expensive. I would rather watch a movie at home where I can sprawl out on the couch with my cozy blanket and eat a big bowl of homemade Kettle Corn. You can’t watch a movie without popcorn and Josh makes the BEST Kettle Corn. I request it every time we turn on a flick. I start the previews while Josh makes a batch of his famous Easy Kettle Corn. 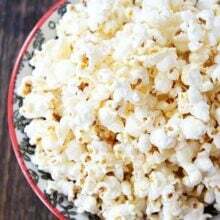 And if you are a fan of the kettle corn you smell at fairs, farmers markets or sporting events, you are in for a real treat because it is SO easy to make at home. You are going to LOVE this kettle corn recipe! Popcorn is one of my favorite snacks. I love all varieties, sweet and savory. Twix Caramel Popcorn, Reese’s Peanut Butter Popcorn, and Garlic Rosemary Parmesan Popcorn are a few of my favorites. I usually make them for special occasions though, not our weekly movie night. Josh is in charge of providing the Kettle Corn for our movie date nights at home! You only need four ingredients to make Josh’s famous homemade Kettle Corn. This Kettle Corn recipe couldn’t be easier! And guess what? There is a secret ingredient: coconut oil! 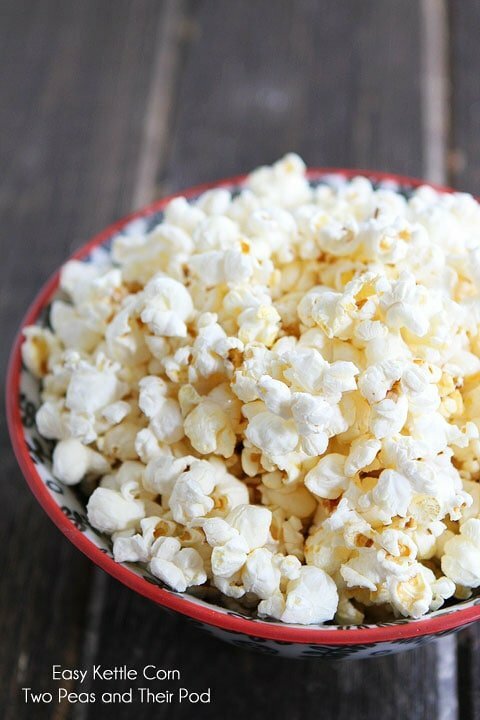 Coconut oil is great for popping popcorn because it tolerates high heat. It adds a slight coconut flavor to the popcorn, but it isn’t overwhelming. Don’t worry if you aren’t a coconut fan. The flavor won’t overpower your popcorn. Josh makes his Kettle Corn on the stovetop with his special Whirley Pop Popcorn Popper. It is his pan, he doesn’t let me touch it. He is the popcorn master at our house. His special popcorn popper has a turn crank on the handle so he can stir the popcorn. This keeps the corn moving across the bottom of the pan, for even heat and oil distribution, ensuring the best popping results. If you don’t have a Whirley Popper, you can use a large pot. Just make sure you shake the pot so the kernels don’t get stuck! The key to making the best kettle corn is letting the sugar caramelize just a bit over direct heat as the popcorn pops. You are going to love this sweet and salty popcorn! The Kettle Corn only takes a couple of minutes to pop up! It’s a great snack for movie night, game day, or everyday snacking! You can keep the popped Kettle Corn in an airtight container or Ziploc bag for up to 3 days. Josh’s Easy Kettle Corn is one of our favorite snacks too! Kettle Corn is a hit with our entire family! I think you will like it too! Get popping! This is our all-time favorite Kettle Corn Recipe! It's easy to make and great for movie night, game day, or snack time! 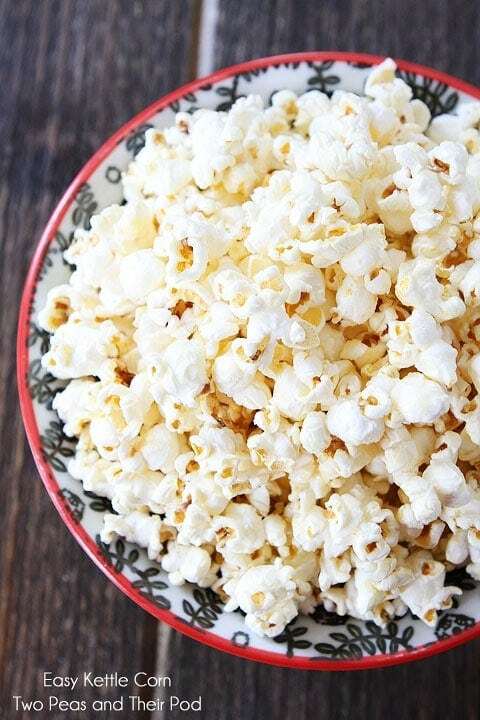 In a Whirley Pop Popcorn Popper or in a large pot with a lid, heat the coconut oil over medium-high heat. Add the popcorn kernels. When the coconut oil sizzles, sprinkle the sugar over the popcorn kernels. Cover and stir or shake the pan until the popping slows down. The popcorn should be done popping in about 2 minutes. Remove from the heat and pour the kettle corn into a large bowl. Sprinkle with salt and toss. Enjoy! Note-the kettle corn will keep for 2-3 days. Store in an air-tight container or Ziploc bag. 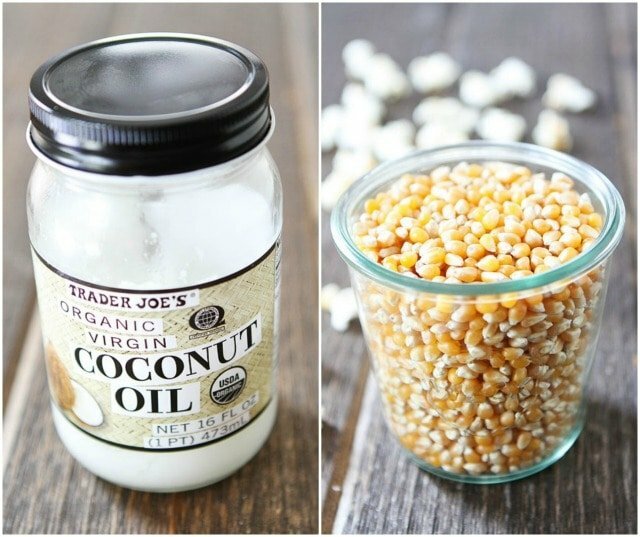 We use TJ’s Coconut Oil all the time for popcorn! It’s the best oil to use and gives the popcorn a true movie theater taste! We just love it! Now you got me craving popcorn! Yum! I love kettle corn and have been wondering how to make it–I had no idea it was so simple! Coconut oil is such a fabulous & healthy oil to pop your popcorn in. I will definitely have to try this. I wonder if it would work with brown sugar or even coconut sugar? yum yum yum! I love kettle corn. It is one of the best snacks ever. I’ve never made my own! LOVE, LOVE kettle corn! Thanks for the recipe! The whirly pop is broken out around here a least a few times a week. We snack on popcorn all the time. It really make the perfect healthy snack! I will have to give coconut oil a try. Sound perfect! I love that bowl it’s beautiful – where did you get it? Also, great idea using coconut oil – I never thought of that! The bowl is from Anthropologie! OMG! I have a Whirley Pop and I can’t wait to try this recipe!!!! Too bad is 9am and I’m at work and can’t do it right now… Im going to be craving kettle corn all day today!!! Hahah! Thanks for the recipe Maria (or should I say Josh?)! I make this all the time at home. If you use brown sugar, it looks and tastes like caramel corn! I often use only 2 T of oil for this (same popcorn and sugar amounts). It works fine with the smaller amount and leaves no hint of coconut flavor. This sounds delicious! I love kettle corn! 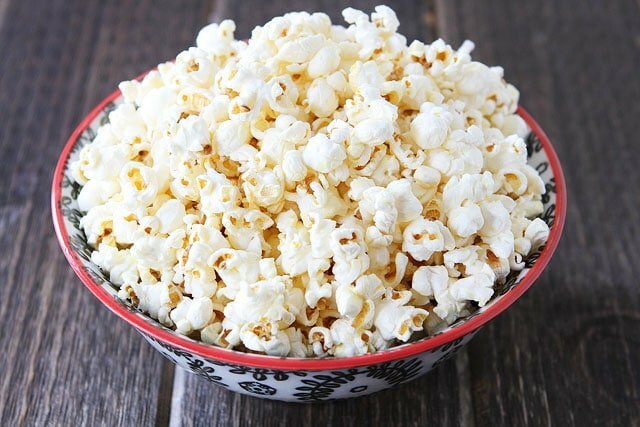 Great popcorn is so easy to make at home! I make my Kettle Korn this way as well but use canola oil instead of coconut. Great idea, I think I’ll try using the coconut oil this weekend to see if I notice any difference. Just made popcorn last night. Such an easy simple snack. Never thought to use my coconut oil with it though. Great idea! I love kettle corn! I think the whirley pop is the secret because otherwise mine always burns! I may have to pick one up today, kettle corn is my fav! This is so perfect for snacking and any movie night!! I love kettle corn – I could have an entire bowl to myself!! YUM! I don’t have coconut oil but I’m going to try this with Canola oil (I make popcorn all the time at home, just in a regular pot though). I can’t wait to try this. I have a slight allergy to coconut so I will avoid coconut oil. Sounds like a perfect date night to me! I’m with you – I’d rather watch a movie at home. you guys must’ve read my mind! i was popping popcorn on the stove the other night and wondered how to make kettle corn!!! thank you so much for the recipe!! and interestingly enough, i use coconut oil for popping popcorn too and love the taste!!! I love kettle corn!! The sweet and salty combo is so good! I love that Josh won’t let you touch his pan!! I’ve tried to make kettle corn & I burned the sugar – I’ll try Josh’s recipe soon! I wanted popcorn a few days ago, and I had some pumpkin spiced white chocolate. So I popped some corn on the stove. In the microwave I melted about 4 oz. of the chocolate with some pumpkin pie spice thrown in. Then I added the popped corn, added salt & stirred. I put it into the refrigerator for about 15 minutes to firm up. It was delicious! I’m going to get some candy corn to add for Halloween. I may even make it two toned with a batch of semi-sweet chocolate, then combine them. Gotta eat your veggies! I’m not sure how to use the different kinds. Never mind in the above question! I just saw the picture! I love kettle corn and can’t wait to make it! I can’t remember the last time I went to the movies. So much better to watch at home which I do at least a couple times a week. 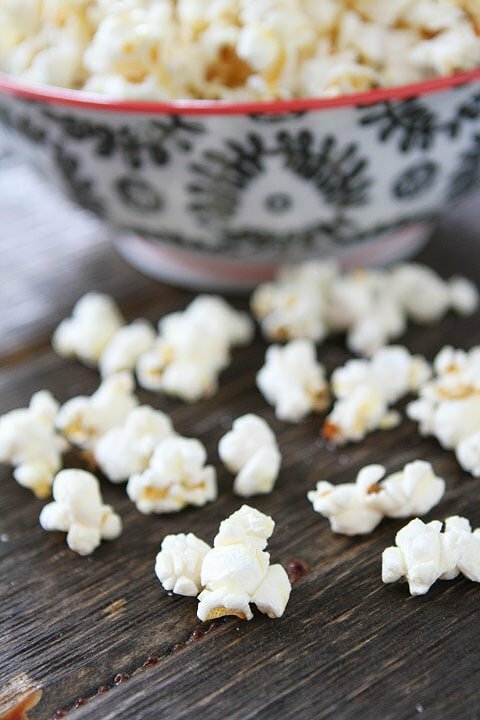 I love the idea of adding coconut oil to simple popcorn – yum! We had a Whirley Popper & used it fairly often until we remodeled the kitchen & changed our stovetop from an electric cooktop to an induction cooktop. 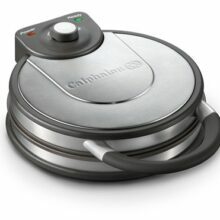 Induction requires the use of cookware with a magnetic surface & to my dismay, the bottom of the Whirley Popper is not magnetic so I had to give it away. Loved the crank handle! How have I never used coconut oil in my popcorn?! Love this Maria! Great snack for anytime! I always use coconut oil in popped corn too. GREAT recipe! Boy, I couldn’t agree more…I think it is cold, uncomfortable, expensive at the theater too. I would add one more, the popcorn is so bad with the fake butter. Thanks for the recipes. Thank you for the recipe! Made it last night and it turned out great! It warms my heart to know someone else uses the crank pot and coconut oil. I use the extra virgin coconut oil – definitely not as healthy – but I find the regular coconut oil too strong. Coconut oil is the secret as well as type of kernel. I like the soft white kernel, sometimes the less expensive generic yellow kernel (jumbo popcorn) is what I desire. The muti coloured mix with blue, black, orange-ish kernels are my least favourite. Type of salt is important for me. In popcorn I use Pink Himalayan salt from the grinder, when I have it, it makes a difference. Thanks for this recipe. Would love to read more about popcorn (non sweetened) and different kernels. Just wanted to say, you can get coconut oil without flavor. I have bought it at a Whole Foods Grocery store. I have also bought it at Walmart. I am not sure if Trader Joe’s has it or not. I fry chicken in it and it tastes just like Grandmother made! Oh I also have a crank pop corn popper. I even bought a new one …still in it’s box for when this one dies…..just in case I can no longer buy them. Headed to the kitchen right now to try this recipe. Thank you! Thanks! I will try this soon! My grandkids and I made kettle corn a few days ago when I was helping them with some hand sewing. It was so good! I make my kettle corn with vanilla sugar. To make the vanilla sugar I cut a vanilla bean lengthwise then crosswise and bury them in a cup of extra fine sugar in a canning jar. After about a week you will have nice vanilla sugar. A month is better, but I can’t seem to let it go that long. The vanilla sugar on kettle corn is awesome! Another thing about kettle corn, see if you can get your hands on mushroom popcorn. I found mine on-line. Do a google search for “mushroom popcorn” and you will find lots of places to buy it. You can even buy it on Amazon. What’s so great about mushroom popcorn is that it pops up big and round and has lots of nooks and crannies to hold the sugar. It’s also practically hull less. We love kettle corn and make it all the time, but use brown sugar instead. I just made this and me and my husband ate the whole bowl!! Absolutely delicious…will definately be a favorite from now on! Thank you for all the wonderful recipes. I’ve made this awesome recipe probably 6 times and I love it, but for some reason, the last two times I’ve made it, I burn the sugar mixture and instead of taking 2 minutes it takes like 10. Maybe I’m cooking it too low? This recipe turned out amazing even with just a regular pot and store brand sugar!! I did however use TJ’s virgin coconut oil. Thank you so much! My kids loved it! Will fine popcorn salt work as well as the sea salt? The maker of the Whirley Pop says immediately after emptying the kettle popcorn to run hot soapy water into the popper in order to ease clean up. Well, I have one of those old fashioned looking movie theater poppers in my office. Before I found this site, I figured I would do a little experimenting. I put the oil and corn in, waited a few seconds, then poured a pack of sweet n low in…..once it was popped, I put a little salt on it. It actually is not bad at all. Thanks for the recipe. I’m trying this tonight! Funny, I use coconut oil and organic pop corn to make mine too! I’ve tried using regular sugar to make kettle corn, but one day I was out and only had brown sugar. In a pan I melt 1/2 stick of butter, and 1/2 – 3/4 cup brown sugar. I mix till the butter is completely incorporated into the sugar, and let cook for a minute. Then I pour over the pop corn while tossing to coat. Plus some salt to taste. 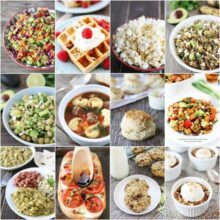 Thanks for your posts, I have lots of things pinned, and can’t wait to start cooking! Thank you! I just made some and it’s really great! And SO easy! I make popcorn in a large pot on the stove all the time, but when I tried your kettle corn recipe, it just wouldn’t pop. Seriously, the temp was high enough and I gave it plenty of time, but it was going on 10 minutes, and was just a solid mass in the pan. Could I have added the sugar too soon? Just made this, in just a regular pot with lid. .. so yummy. Definitely going to make again. The key to not burning it when you don’t have fancy equip or maybe coconut oil (or maybe even if you have those things) is not to put the sugar (brown is good) until the oil and corn is super hot and ALMOST ready to pop. If you do it too early, you are kind of doomed, popcorn wise. awesome. i used brown sugar instead to make caramel corn. quick, delicious. Your recipes are wonderful! I didn’t have a Whirly-Pop anymore, so I knew I had to watch my temps carefully and keep shaking that pot. The kettle corn turned out just right–my new favorite way to do popcorn. This could easily turn into a habit! Yum! Thank you, that was great, and so easy! Actually virgin coconut oil has a smoke point of about 350 degrees, which is very low, similar to butter. It does taste great though. The movie theaters use refined coconut oil, which has a 400 to 450 degree smoke point. I just made this recipe about 5 minutes ago! It is perfect! It tastes great. Just the best kettle corn I’ve ever had. Thank you! Hey–thanks for the recipe. Can’t wait to give it a try. Wish I still had the old popcorn popper with the stirrer on the bottom. We got it for a Christmas gift years back…..then microwave popcorn became the craze, so….I gave it away! 🙁 Must get some coconut oil…sounds like it just might be the secret ingredient. This kettlecorn is AWESOME! We make it every movie night. 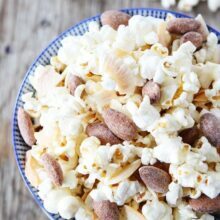 Do you think I could use a theater popcorn popper for this recipe? We have a 6 oz popper? Mmm! I used brown sugar, kosher salt, and about two Tblspns. of soybean oil, which was the only ingredients available when my munchies hit; it came out great, tho a little burnt on the bottom. Hoping it comes out of my Whirley Pop after a good soak and a scrub. Yummy, thanks! I agree with you on the movie theater thing, for sure. I will definitely have to try out this new kettle corn idea, because microwaves make me feel weird and kettle corn is the best 🙂 THank you! Just read your candied pecan recipe, and now this. Both so easy and just heavenly! Definitely putting two together, but since I can’t get enough of either, it could be dangerous 😉 love all your recipes, thanks and keep up the fantastic work! I own a Whirley Pop popper too! I love it so much. I also love kettle corn and have not made it in my Whirley pop or with coconut oil, so I am super excited to make this my new favorite kettle corn recipe. Thank you for sharing. I also have a whirly popper. The kettle corn was fab. Super yummy, it came out great the first time I made it! Sadly, I don’t own a whirly gig. How could this recipe be adapted for air popped popcorn? Thanks much. Now I’m really in the mood to watch a movie! Minimal ingredients, easy and delicious! I used just a bit less coconut oil than the recipe called for (I was almost out) and love, love, love this simple recipe. I got the whirly popcorn maker a couple years ago when my mother-in-law realized I loved popcorn. I haven’t experimented besides the traditional airpop and classic dry-herb seasoning, so I was so happy to find this recipe to satisfy my sweet tooth! Thanks!